Claudio was born in Palermo (Sicily, Italy). Since his childhood he has shown remarkable interest in musical arts in particular.His grandmother was a pianist, she later took him to study the guitar at the age of 8. He studied guitar with some of the best guitar tutors Italy had to offer.He immediately showed great interest in Blues and Jazz music and he started collecting a lot of vinyls of legendary artists such as Jimi Hendrix, Miles Davis, Albert King, John Coltrane, Charlie Parker, Stevie Ray Vaughan, BB King and many more.At age 13, he felt the need to sharpen his skills on his first love which is the guitar. He studied jazz guitar with a Brass Group in Palermo, which is known as the international jazz music school.At the same time, having several blues, jazz and funk vinyls, he started playing in private parties for his close friends and from that moment on, his passion for blending guitar and dj sets began.In the early 1990's until 2000, he was a resident Dj at Bier Garten in Palermo, a very exclusive House Music Club. He gained a lot of experience which led him to open dj sets for many internationally renowned djs.Claudio plays as DJ in several clubs around Europe and is also a session artist for many prominent artists around his home town and Europe as a whole.Today Claudio La Barca is a producer and plays on all his Songs. 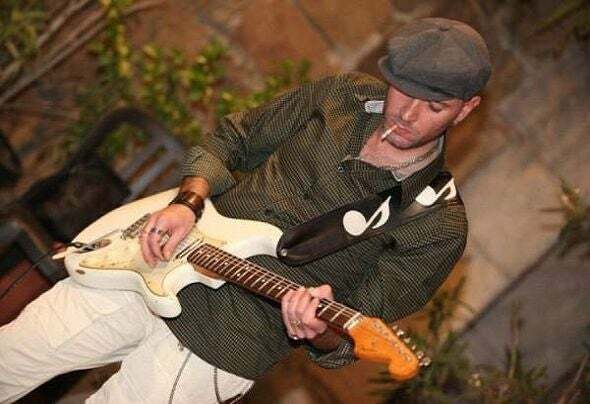 Not only does he arrange his own music, he also plays rhythm guitar parts, solo guitar improvisations, electric bass and piano and synthesizers.His passion for music always pushes him to experiment on blending electronic music into jazz, blues, funk, afro, Mediterranean and Middle Eastern music.